Thorncrown Chapel was the dream of Jim Reed, a native of Pine Bluff, Arkansas. In 1971 Jim purchased the land which is now the site of the chapel to build his retirement home. However, other people admired his location and would often stop at his property to gain a better view of the beautiful Ozark hills. Instead of fencing them out, Jim decided to invite them in. 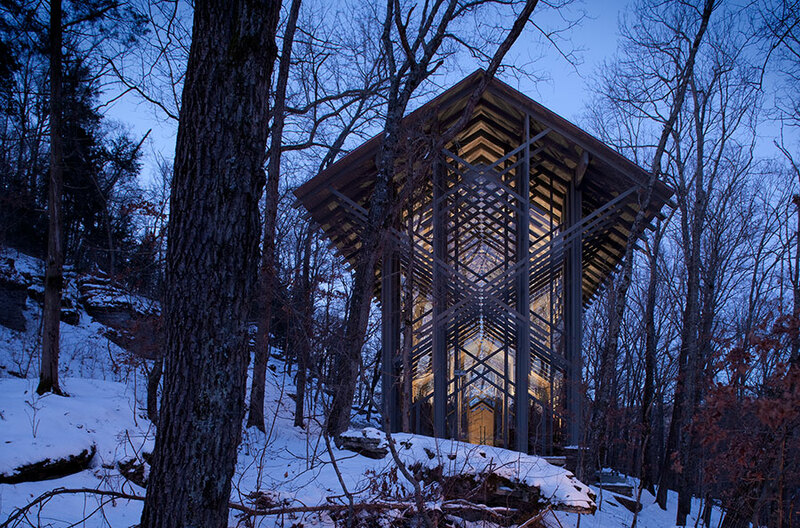 One day while walking up the hill to his house, the idea came to him that he and his wife should build a glass chapel in the woods to give wayfarers a place to relax in an inspiring way. 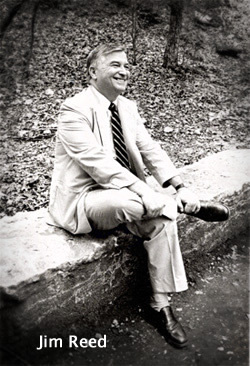 Shortly thereafter Jim met E. Fay Jones, a professor at the university of Arkansas at Fayetteville. Much to Jim's surprise, Jones was quick to accept the proposal to design the chapel. On March 23, 1979 the construction crew broke ground on the mountain side. Jim's dream looked like it would soon be a reality. However, half way through the project, funds began to run out. Soon the building process ground to a halt. In his own words, it looked like Jim had made "...the biggest mistake of my life." He desperately tried to raise the necessary funds to complete his dream, but all of his efforts failed. Finally, one evening Jim took what he thought would be one last walk down to his half-finished chapel. He would take one last look and never return. Then the unexpected happened. He said, "I am not proud of the fact, but the first time I ever got down on my knees was on the chapel floor. I prayed more seriously than ever before. All the trials and tribulations gave me the humility to get on my knees." This was a turning point in Jim's life and in the construction of the chapel. In a few short days all the money Jim needed was made available. On July 10, 1980 Thorncrown Chapel opened. Since then over six million people have visited this little chapel on the hillside. It has won numerous architectural awards such as the American Institute of Architects Design of the Year Award for 1981 and AIA’s prestigious 25 Year Award. Recently, members of the American Institute of Architects placed Thorncrown Chapel fourth on its list of the top buildings of the twentieth century. It has been featured on television programs such as NBC Nightly News and the 700 Club. Almost every major magazine in the country has carried a story about the chapel including Time, Newsweek, and Parade. The chapel is located on Highway 62 West just outside of Eureka Springs, Arkansas. There is no admission fee, but donations are accepted. Every tour group will receive a presentation telling the story of the chapel. There is ample parking for buses and RVs. So, while in the Ozarks, stop by what many have called one of the most beautiful and inspiring chapels in the world. It will be a visit you will not soon forget. If you would like to read the full version of Thorncrown's inspiring story, click here. ©2015 Thorncrown Chapel, Inc. All rights reserved.